Hi friends, I’m Katie! I am a mom of 2 who loves to see my kids smile and always have a camera in my hand determined to document each moment. My little troop and I are so glad to be visiting here with you sharing a fun ice cream handprint craft (thanks Amanda). We have been sharing several ice cream activities on our blog this week. This craft is just a small taste of the types of fun things we are up to all day. Let me introduce my toddler son who is as busy as can be and on a quest to jump from the highest point he can climb to, and my preschool-aged daughter who loves to dress up as a princess, make dirt pies, and is determined to understand the world around her one question at a time. I hope you will stop by and say hi to the kiddos and I at A Little Pinch of Perfect. We have been having an Ice Cream inspired week and now we are putting the cherry on top- of our ice cream handprint craft that is. We are so glad to be here sharing it with you so you can make some adorable scoops of ice cream using your kiddos hand. My heart melts every time I see my kiddos cute little handprints; they are growing so fast so any craft preserving a part of them is instantly cherished with this craft being no exception. So, let’s get started! To make our paint resemble ice cream, we mixed in some white paint to mute the colors. We used water color paper because I wanted to frame our art, but printer paper should work fine for an everyday craft project. 1. Use a paint brush to paint the palm of your kiddos hand one color and paint their fingers another color. I like using contrasting colors like a warm color paired with a cool color but since it’s your kiddos craft, you can also let them decide. Two ice cream scoops per hand look the cutest for this Ice Cream Handprint craft. 2. 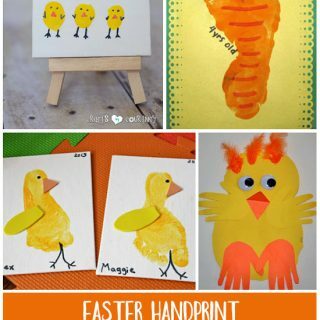 Make a handprint on the paper. I liked our handprints with the fingers spread out just a little bit instead of being tight together or open wide. Let paint dry. Check out my Secret Tip for getting the perfect handprint every time. I kept a wet paper towel handy so we didn’t have to run to the sink in between each color combination. I just wiped the kid’s hands off and painted them again. They each had their own piece of paper where they made 3 ice cream cones and we used a paper for a group painting where they each made one ice cream cone. It would be fun to paint mom and dad’s hands too. My plan is to write the kids names and date the painting before hanging them up on the wall. 3. Paint kiddos thumb red, and dot the top of each handprint to make the cherry on the top. 4. Use white glue to add the ice cream cone outlines. We are huge fans of glitter in our house. 5. Sprinkle glue with glitter and let dry. She used one tube of glitter per ice cream cone. Shake the extra glitter off onto a paper and dump back into the container to save it for next time. 6. Meanwhile, cut ice cream cones out of the brown paper. I folded our paper and then used a ruler to draw straight lines, grabbed my scissors and cut them out. Dip a fork or pizza cutter into brown paint and draw lines on your ice cream cone. I love the way the lines make our ice cream cones look so cute! 7. Glue your ice cream cones to the bottom of your ice cream handprints and you are done! 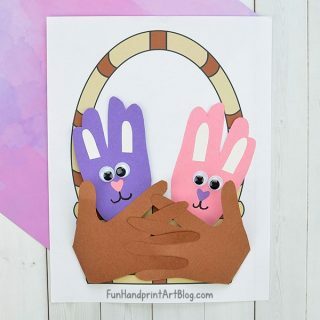 An Ice Cream Handprint craft cute enough to hang on an ice cream parlor or family refrigerator. Aren’t you curious what other Ice Cream inspired activities we have been up to? Check out our Playdough Ice Cream Recipe for Sensory Play and our Ice Cream in-a-bag Recipe, I promise it will be worth the visit! Hi, my name is Katie and I'm a busy mommy who can be found covered in paint or running wild in the backyard, all to entertain two little people all day long until it's time for bedtime. The kiddos and I are all about crafting, sensory play, playing with our food, and enjoying activities that facilitate learning through play. They keep my life full of surprises and laughter and everyday I feel lucky to be their mom!I hope you will stop by and say hi to the kiddos and I at A Little Pinch of Perfect. Hi, my name is Katie and I'm a busy mommy who can be found covered in paint or running wild in the backyard, all to entertain two little people all day long until it's time for bedtime. The kiddos and I are all about crafting, sensory play, playing with our food, and enjoying activities that facilitate learning through play. They keep my life full of surprises and laughter and everyday I feel lucky to be their mom! I hope you will stop by and say hi to the kiddos and I at A Little Pinch of Perfect. This is such a cute idea. What a great idea. That has to be THE cutest craft I have ever seen. I am definitely going to do this with the little kids at church sometime. So cute! I can’t wait to do this with my little ones! These are so much fun. What a great way to put a handprint from all of my kids onto one project! What a wonderful craft! I love the end product. I have pinned this idea to try later. I absolutely adore this idea. I’m sure my kids would love to do this craft too. What a great summer craft – and they look even better framed! What a cute summer memento!